Italy has drawn criticism for handing over to Libya migrants it intercepts at sea, without screening them first. Far fewer now reach Italy from Libya. Col Gaddafi has forged close ties with Italy since a friendship treaty was signed two years ago. It sought to draw a line under historic bitterness between Libya and Italy, its former colonial master. He was speaking at a ceremony in Rome late on Monday, standing next to Italy's Prime Minister Silvio Berlusconi. Col Gaddafi has long seen himself as a champion of African interests on the international stage and has hosted many summits with African leaders. 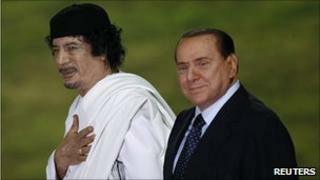 Mr Berlusconi made no immediate comment on Col Gaddafi's demand. Italy has been carrying out joint naval patrols with Libya for the past year, intercepting illegal migrants at sea. The BBC's David Willey says Col Gaddafi's visit to Rome was overshadowed by another controversial speech he made - to two groups of several hundred young Italian women, hired at a fee of 70 or 80 euros each from a local modelling agency.